I nearly tripped over it. 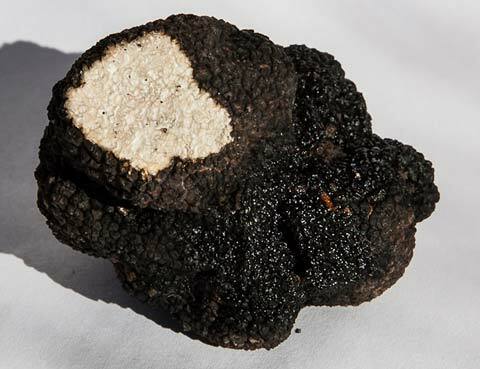 I’d just dug up a rotten truffle from the middle of our little patch of oaks and hazels infected with Tuber aestivum syn uncinatum, the Burgundy truffle, and was pretty excited. 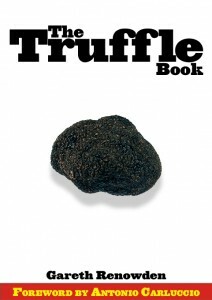 It was our first Burgundy truffle and it was rotten and I couldn’t eat it, but that didn’t matter. The twelve year old plantation was finally producing truffles. Another long wait was over. And then Rosie pulled me off to another spot a couple of metres away and there was a truffle sitting in a little depression in the soil surface. 53 grammes of fungal goodness — not ripe yet, perhaps not quite fully grown — but I dug it up anyway. Call me impatient. Ours was one of the first trial plantings of aestivum infected trees in New Zealand — oaks infected with truffle inoculum from Gerard Chevalier in France went into the ground in 2000 ((There’s a picture of Gerard with one of our seedling oaks in The Truffle Book, p131)), followed a couple years later by hazels infected with aestivum supplied by Christina Weden from Sweden. Both this week’s truffles were found close to hazels. Skol, Christina!